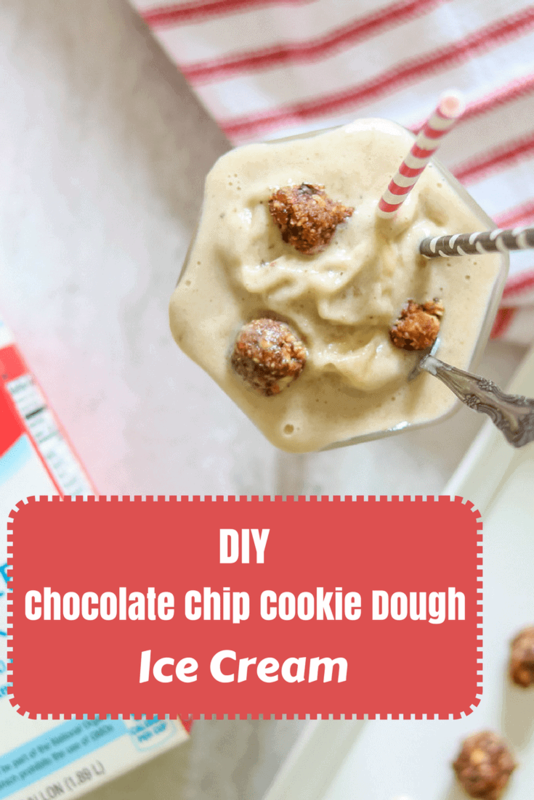 DIY Chocolate Chip Cookie Dough Blizzard: A few simple ingredients come together to create a wholesome, no churn, easy ice cream treat. 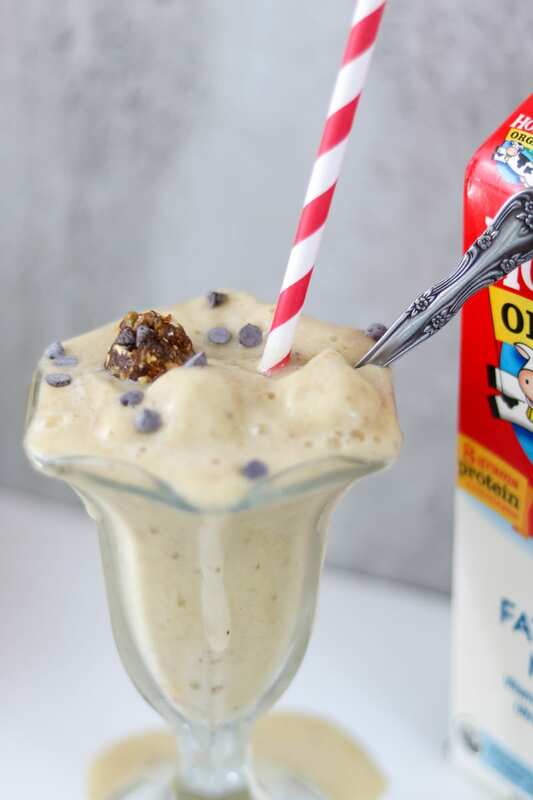 This cross between a sundae and a milkshake will satisfy your sweet tooth while still being perfect acceptable for breakfast! Thank you to Horizon Organic for sponsoring this post. As always, the text and opinions are 100% my own and only products I love are featured on my blog. I don’t know about your kids, but mine sure have a sweet tooth. Truth be told, I have a sweet tooth myself. In fact, myself and my kids crave a dessert daily. EVERY. SINGLE. DAY. 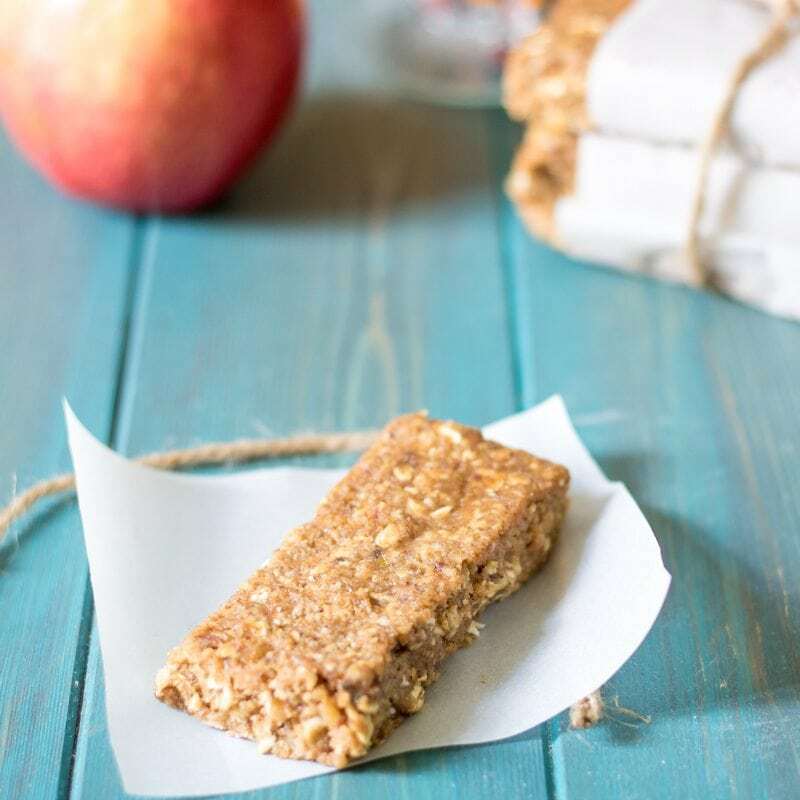 Instead of depriving them from desserts, I opt instead for showering them with snacks that are wholesome and nutrient rich, like Oatmeal Cookie Raisin Bites, Oatmeal Chocolate Chip Cookies, or Apple Pie Granola Bars. These treats are made sweet from fruit–not refined sugars or even natural sugars like maple syrup or honey. And while there is NOTHING wrong with a piece of chocolate cake, that just can’t be happening on a regular basis! So brace yourselves for this wholesome treat. It is creamy, chocolatey, rich, thick, sweet and satisfies you to the core!! So let’s break this Cookie Dough Flurry down. You must start by making the cookie dough. 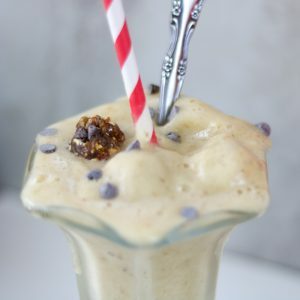 I made a healthy chocolate chip cookie dough by pulsing almonds, softened dates, and chocolate chips together in my favorite food processor–it is like a Chocolate Chip Cookie Dough Larabar and it is SO SO good! Then you need to make the no churn ice cream or nice cream. 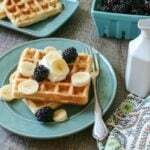 It is simply frozen bananas with organic Horizon milk and a dash of vanilla extract. It blends up perfectly in a quality blender (like this brand ), but you can also use your food processor you already had out to make the cookie dough. Then you just mix in the cookie dough into the wholesome ice cream and BAM!!! Want to win parent of the year? 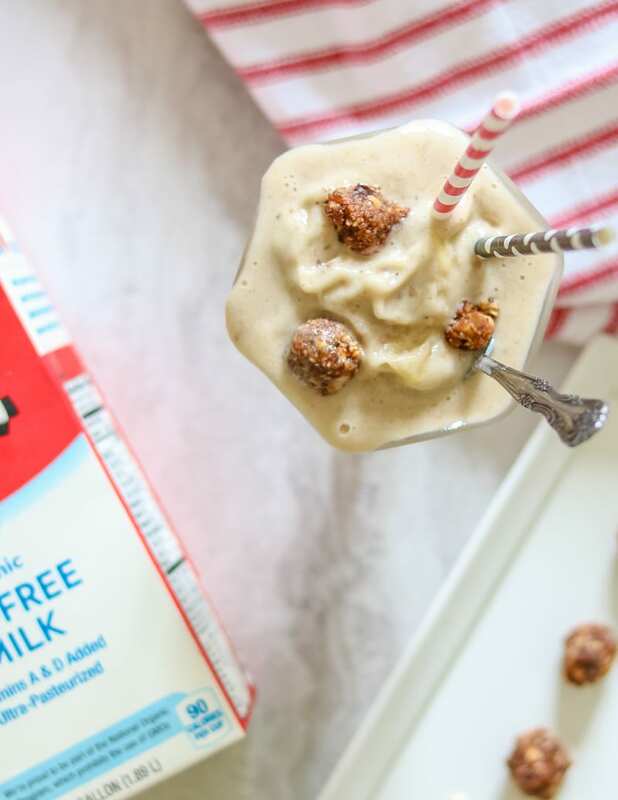 Serve up this wholesome milkshake made with Horizon Organic Milk! You won’t feel an ounce of guilt showering your kids with this dessert on a regular! 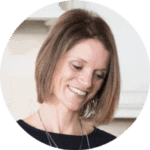 Be sure to watch the video for a great tip on how to soften your dates to process perfectly! Start with the base for this Nice Cream or Blizzard and feel free to change up what you add in if cookie dough is not your thing. A swirl of peanut butter or maybe some strawberry jam. You could also use these Chocolate Covered Cherry Protein Balls or Apple Pie Bars or Oatmeal Raisin Larabars in this ice cream as well. If you want your Blizzard to be more like a Milkshake, add up to 1/2 cup additional milk. If you want your Cookie Dough Flurry to be thicker, cut the milk in half. I used Skim Milk but 2% or whole milk work just as well. If you want to be completely decadent you can add in this Edible Cookie Dough from Love from the Oven. A few simple ingredients come together to create a wholesome, no churn, easy ice cream treat. This cross between a sundae and a milkshake will satisfy your sweet tooth while still being perfect acceptable for breakfast! Soften the dates in boiling water for at least 5 minutes. Process the dates and almonds together in food processor until they come together to form sticky dough. Add chocolate chips and pulse a few times to incorporate chocolate chips into dough without breaking down. 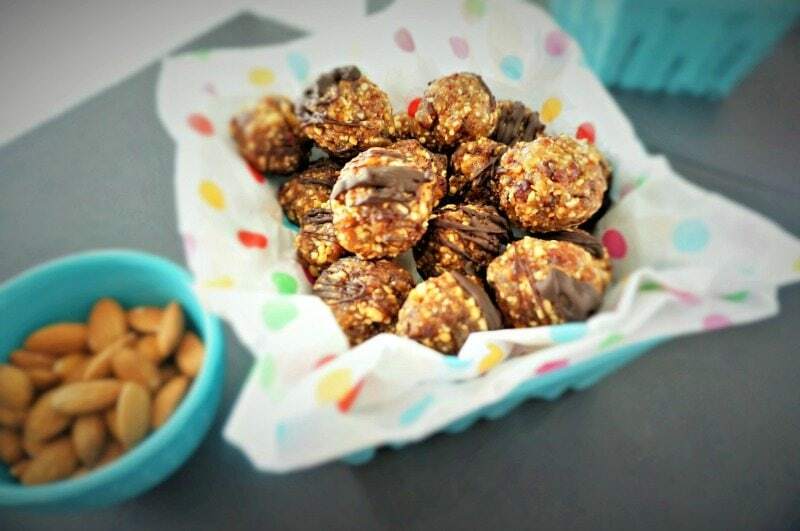 Roll into small balls or leave as small chunks to incorporate into the ice cream. Place milk and frozen bananas into blender and blend well, scraping the sides down once or twice, and continuing to blend. Mix the cookie dough into the banana mixture with a spoon or spatula. Serve with additional chocolate chips and a spoon and straw. 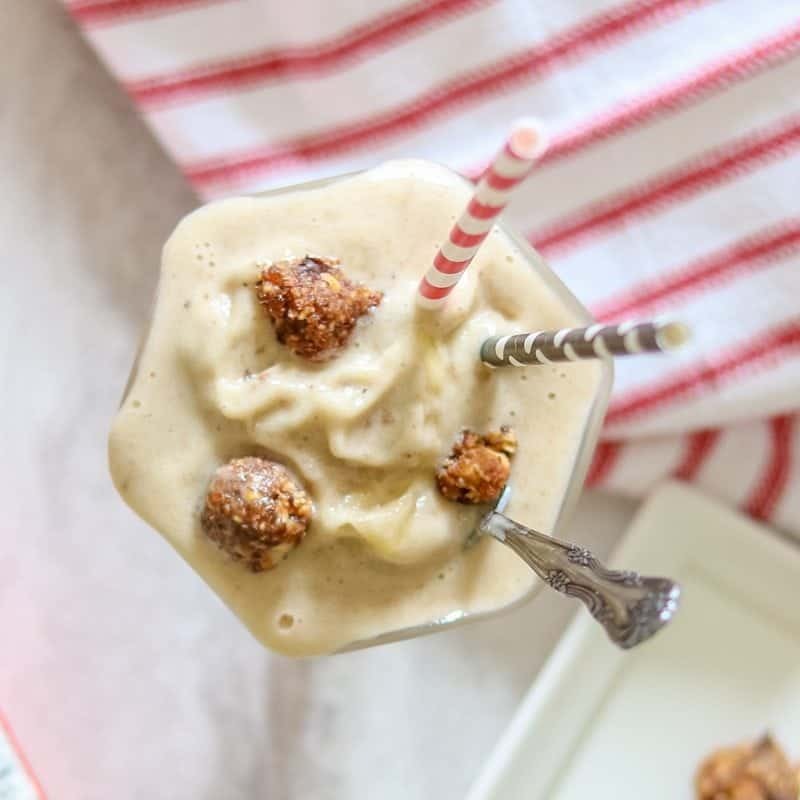 Kristen, I love that this is sweetened with dates and bananas!!! Yea for natural sugar!!! Looks like a must try!! Thanks Felesha. I love using natural sugars whenever I can. Oh my gosh I love this!! Cookie dough ice cream was my fav as a kid. What a great healthy twist!! 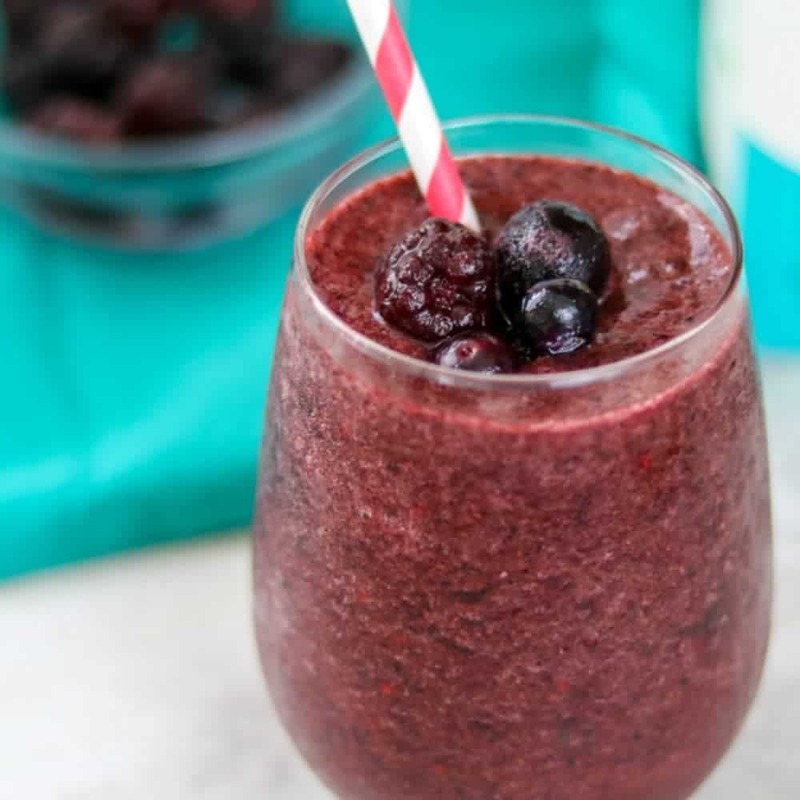 This is a PERFECT healthy treat for you! I can’t believe how good this is for you – only natural sugars?! Very impressed!!! You’d never know! Eek! What a fantastic treat for all my kids… and my husband too!! HAHAH…well I know a couple (or 4) people who happen to LOVE DQ blizzards. Next time they are over, I will have to surprise them with a homemade version. 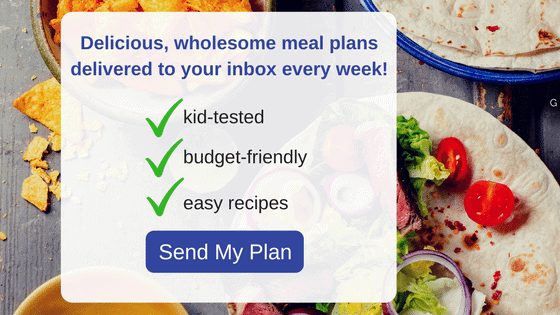 Love the new site design and can’t wait to try this! Thanks so much Merium! I am loving it as well! I LOVE using dates in dessert. They’re so good for you, and taste amazing! Love the use of dates here, Kristen! It’s something I’ve never tried in a milkshake, but it sounds delicious! It really is quite tasty! Ohhhh I love blizzards! This looks so good! You have to give this a try! What a fabulous idea for a family fun-filled treat! Homemade blizzard for the kids…awesome idea!! Can’t wait to make this for my kids! I am sure they would! Oh my goodness, I can’t wait to make this at home! My daughter has food allergies and Blizzards are one of the things she misses most. It looks so good! Oh this makes my heart so happy Christi!! I hope your daughter enjoys every bite of this!